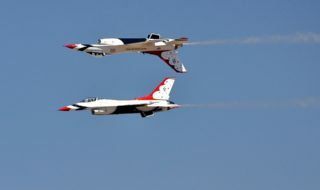 The US wealth gap hasn't been this big since the "Roaring '20s"
The Roaring Twenties — a period also called the Jazz Age, the Age of Intolerance, and the Age of Wonderful Nonsense. Everything seemed possible with new technology, there was opportunity everywhere you looked, the sky was the limit. But, as the high-life 1920s society became more enamored of wealth and everyday luxuries, another unseen group of people grew in numbers: the poor. The roaring twenties also had roaring inequality — and we’re seeing the same trends in today’s society. The wealth gap is increasing at an alarming rate. Image credits: Emmanuel Saez and Gabriel Zucman. When it comes to inequality, we’re more used to talking about the wage gap — but instead, this study focused on the wealth gap, which includes the entire assets held by a household. Since the 1980s, the wealth of the top 0.1% of people (who have over $20 million in assets) has substantially grown. 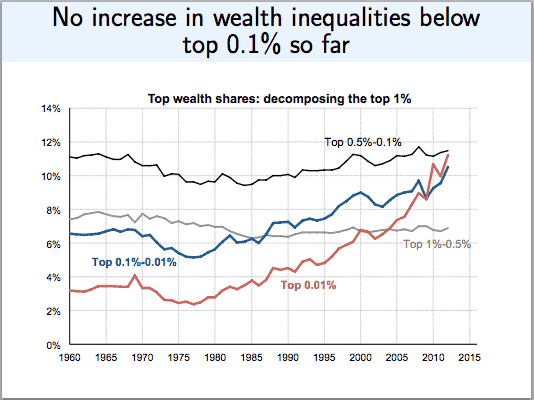 The wealth of the top 0.01% has grown even more. However, for people below the 0.1%, there hasn’t been a big jump. It’s not just that the middle class is losing ground, but even the “middle rich” — the people who are in the top 10% but not in the top 1% — are losing ground. So it’s not that the rich get richer — it’s more like the very rich get much richer. Image credits: Emmanuel Saez and Gabriel Zucman. There’s also a disturbing racial component when it comes to the wealth gap: melanin seems to be inversely correlated to wealth. The mean wealth of black households is $138,200 and $933,700 for white households. Recent studies are likely to underestimate the level and rise of inequality, as financial globalization makes it increasingly hard to measure wealth at the top, researchers say. 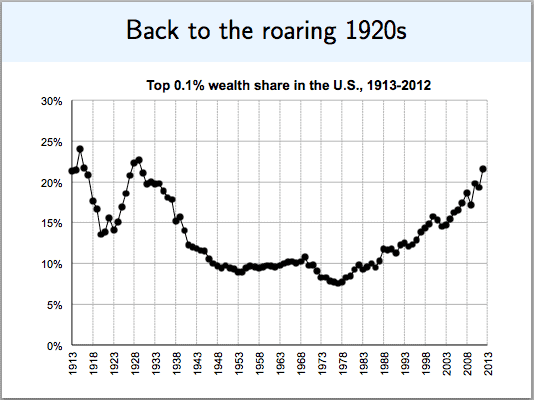 As a result, we are seeing wealth inequality resembling that of the 20s. While the economic factors are different compared to then, the concerns are very similar. It’s estimated that 1 in 3 Americans has no savings at all, and while profits are soaring for many industries, salaries are often stagnating. There is no sign whatsoever that this trend will stop or reverse. The Roaring Twenties ended with the Wall Street Crash of 1929 and were followed by the Great Depression — one of the most severe periods of economic hardships in modern history.